The region around Kargopol was known for its salt wealth, which funded the construction of the town’s unique white stone churches. Among the many treasures of the historic Russian north, one of the richest is the town of Kargopol, located in the southwestern part of Arkhangelsk Region. Despite the town’s small size (current population 10,000), the majestic beauty of its central cathedral ensemble is testimony to its importance in bygone times. To this day there is disagreement on when Kargopol was founded and what its name means. Yet it is considered to be one of the oldest northern settlements, founded perhaps as early as the 11th century. The town’s favorable location, near Lake Lacha and the origins of the Onega River, attracted the attention of neighboring principalities such as Belozersk and Vologda, as well as Novgorod, which exercised overall authority in the area during the early medieval period. The earliest historical reference to Kargopol is a mention of its Prince Gleb, who fought under Grand Prince Dmitrii during Moscow’s victorious struggle against the Mongols in 1380. Subsequent references to the town occur sparsely in mid-15th century documents. To get to Kargopol take a bus from the Arkhangelsk autostation (departure at 8:15 a.m.). The trip takes approximately 10 hours. With Moscow's subjugation of Novgorod at the end of the 15th century, the Kargopol lands came into the domains of Ivan III. By the 1560s, the town was an important center in the realm of Ivan IV (the Terrible), who granted Kargopol lucrative, much-coveted privileges for the production of salt. The trading routes along the Onega River to the White Sea have long since lost their significance, and salt is no longer the region’s major commodity. Yet Kargopol's remarkable white stone churches remind of its former wealth. And its dimensions are much the same now as they were four or five centuries ago. In 1765, a fire leveled much of the town and severely damaged even its masonry churches. The town was rebuilt according to a regular grid plan promulgated during the reign of Catherine the Great. The construction of log houses was prohibited in the immediate vicinity of churches, both for reasons of fire safety and to allow a clearer view of the white stone churches, which unfold in stately progression along the wide Onega River. 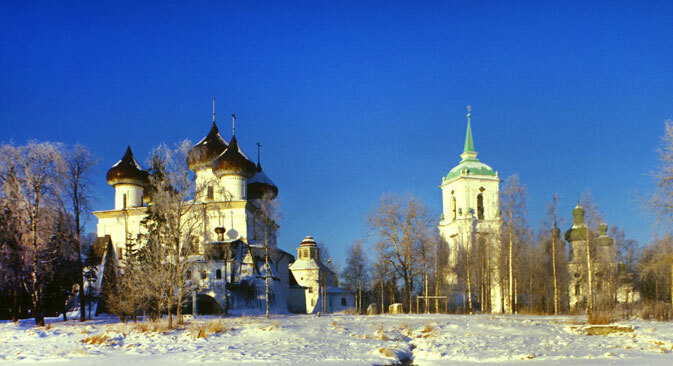 At the mid-point of that plan, near the Onega River, is the town's oldest, and most important, architectural monument, the Cathedral of the Nativity of Christ, begun in 1552 and completed 10 years later. Among its distinctive features is the extensive use of locally quarried limestone for the basic structure. In its essentials, the cathedral design probably derives from Novgorod, which retained much influence over major church architecture in the north during the 16th century. The basic plan is composed of a ground-level space that contained the structure’s foundation vaults and had three altars for services during the long winters. The soaring upper structure was used for worship during the summer. The cathedral’s appearance has changed much since the 16th century, however. In 1652, the ornamental chapel of Sts. Philip and Alexis was attached to the north facade, with a raised porch and flanking staircases. Shortly thereafter a similar structure, dedicated to the Most Merciful Savior, was added to the south façade. A large porch and staircase were built at the main entrance on the west facade. Although these additions provided decorative variety, they also obscured the main structure, which over the centuries has sunk into the ground to a depth of at least a three feet, as the earth around it accumulated. The severity of the 1765 fire caused cracks to appear in the Nativity Cathedral walls. Fortunately, authorities decided to preserve the cathedral and reinforced the walls with large bulwarks at the corners. As a result the imposing white structure, with its five cupolas, seems encumbered on all sides. On the cathedral interior, the fire caused great damage to the frescoes that had covered the walls. Those paintings that survived the flames and smoke succumbed to the elements, as the church roof remained unrepaired for five years. The cupolas, made partly of wood, burned in the fire. The interior walls are now covered in whitewash, and only a small patch of the original frescoes is preserved on the west wall. The dominant feature of the soaring space is the magnificent wooden icon screen, carved and brightly painted as part of the restoration of the cathedral in the late 18th century. With the redesign of the town plan after the fire, the area around the cathedral was cleared to form the so-called New Marketplace, bounded in the northeast by the Church of the Nativity of John the Baptist, built before the fire between 1740 and 1751. Although austerely simple in form, this church with its extended baroque cupolas soars above the surrounding landscape. The centerpiece of the New Marketplace ensemble (also referred to as Cathedral Square) is a monumental three-storied bell tower. The impetus for the tower was provided in 1767 by Iakov Sivers, the governor-general of Novgorod Province, as a dominant element in the revival of the town after the devastating fire. With its mixture of baroque and neoclassical elements, the bell tower was approved by the town as a monument in honor of Catherine II (the Great), although the empress never visited Kargopol. Because of difficulties in obtaining building materials for so large an edifice, construction of the tower lasted from 1772 to 1778. Its completion endowed Kargopol with a point of orientation not only for the town's main streets but also from the Onega River. The northwest part of the Cathedral Square is occupied by the Church of the Presentation of the Virgin, built in 1802-08 in a severe, archaic style that complements the other churches of this central architectural ensemble. The church is now used as a gallery displaying traditional crafts and the work of contemporary Kargopol artists. Just beyond Cathedral Square is the Kargopol Museum, which has done much to protect local church architecture and art. Despite losses during the Soviet period--particularly to churches – Kargopol has retained much of its 19th-century ambiance. A leisurely walk through town reveals many traditional wooden and brick houses. Although the window surrounds are not as elaborate as in central Russia, the decorative elements and proportions of the houses reflect an aesthetic sensitivity deeply rooted in this community of merchants, craftsmen and scribes.